Corriboard signs offer a versatile alternative to traditional metal, wood or solid plastic signage. Their lightness and strength make them ideal for indoor or outdoor use and they can be found in all areas that need signage, from estate agents to auctioneers. 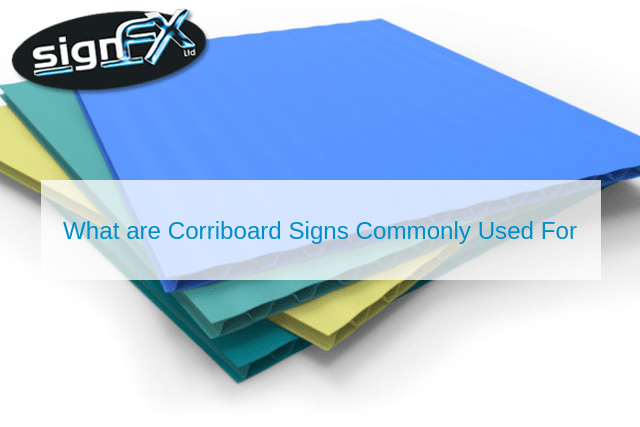 Corriboard can be cut to almost any size or shape, making it the first choice for estate agents. It is ideal for temporary signage such as this and can be supplied in a variety of styles to suit the property being sold. Traditional Flag Boards and T Boards are some of the most popular estate agent signs, they can be printed quickly and are cheap and easy to put up. Swing boards offer a more stylish way of attracting the attention of potential buyers. The movement of the free swinging board catches the eye more than a static one and gives the impression of an exclusive residence. Mounted back to back in a v shape, V boards offer double the exposure and are often mounted directly on the property being sold rather than on a freestanding post. As most election boards are only needed on a temporary basis, corriboard signs offer a rapid and economical solution. Their robustness means they can be found inside or outside and their lightness means they are so easy to put up that just pins or tape can be used. As this type of advertising board is likely to be needed quickly, once we have received your artwork we are usually able to give you the finished product within a couple of days. Full colour corriboard signs will stand out and make an impact at any event. They add a professional touch to any trade stand and can be put up in just a few minutes without any specialist tools or adhesives. An eye-catching display will help draw in visitors and generate awareness of your brand at a fraction of the cost of permanent signage. To make any event a success people need to be able to find it. Directional signs offer a visual guide to the location and can be printed to include branding or other promotional material. It helps create a professional image and the nature of corriboard means these signs can easily be hung on fences or attached to existing structures with the minimum of fuss. Whether you need advertising boards or directional signage, our printers can help bring your idea to life. Please feel free to contact the office today and we will do our best to help get you the sign that you need.